Simple design and proven dependability fill the need for hard working snowmobiles. PRO COMFORT SUSPENSION: This dual-shock, fully coupled suspension features a simple and effective flip-lever torsion spring adjustment to quickly adapt the suspension for one-up or two-up riding, or for hauling a heavy payload. A 40mm, High Pressure Gas (HPG) shock provides exception control, fade resistance, and maximum work capabilities. LED TAILLIGHT: The high-intensity LED taillight/brake light is lighter and brighter than a traditional incandescent design, and delivers a significantly longer lifespan. WORKFORCE MIRRORS: Functional mirrors tout a large viewing area, making it easier to see what lies behind. The mirrors are mounted on the interior side of the Protective Windshield, shielding them from potential damage. TUNNEL DESIGN: The tunnel design includes large snow evacuation holes on running boards with traction. The tunnel is built out of lightweight, high-tensile steel to keep the VK540's legendary rugged durability in the toughest conditions. PROTECTIVE WINDSHIELD: A wide, tall, wrap-around style windshield delivers greater protection from the elements as well as unsuspecting tree branches and limbs. The windshield has been wind tunnel tested to reduce unwanted negative swirl and deliver a greater “pocket” of comfort for both driver and passenger. STANDARD ELECTRIC START: Seamless and easy to use electric start delivers instant and hassle free starts, no matter the weather, eliminating the need for an “old-school” pull rope. STANDARD TOW HITCH: In addition to a host of on-board creature comforts and storage, a standard factory rear mounted tow hitch is at the ready for additional gear or occasional light-duty work. EXPANSIVE UNDER-SEAT STORAGE: With a hinged, flip-up seat, the VK Professional II EPS exudes its work ethic at every turn. The large under-seat storage touts an integrated tool kit and room for much more. 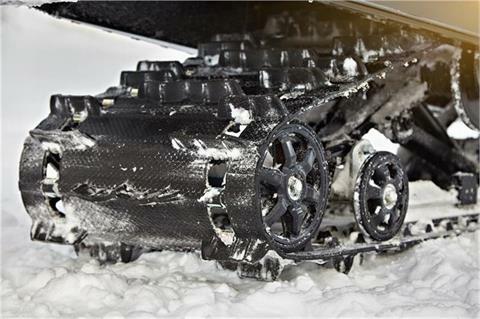 TSS FRONT SUSPENSION: Telescopic struts offer the ultimate solution for deep snow mobility and durable simplicity. HIGH FLOTATION UHMW SKIS: Wide skis deliver added flotation when traveling off-trail, while an engineered keel provides predictable handling and easy to steer manners. 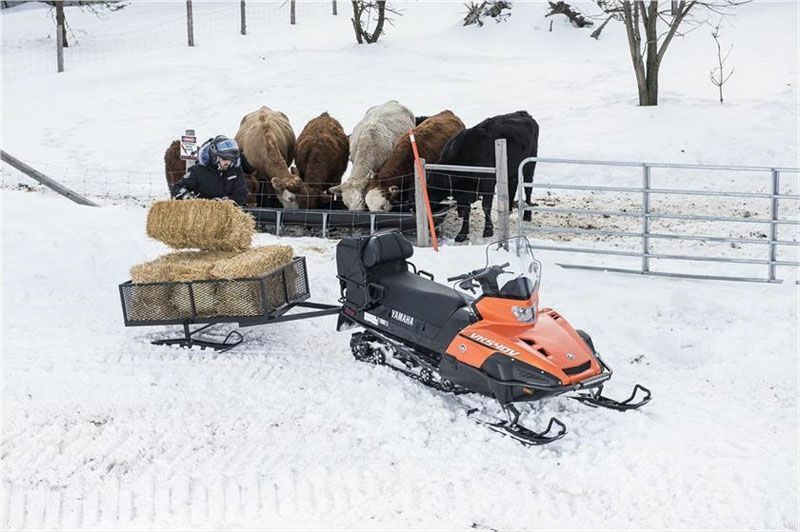 THREE SPEED TRANSMISSION: The Hi / Lo transmission with reverse is workhorse one minute, and a versatile trail cruiser the next. With a simple to use manual actuated lever, you can select from “normal” high range for cruising to low range and pull heavy loads. 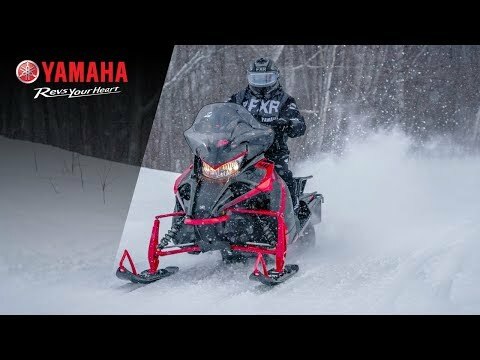 SPECIAL CLUTCH CALIBRATION: Yamaha engineers developed a clutch calibration to maximize the VK's ability while keeping the sled's utility application in mind. The result is a setup that has very smooth engagement and roll out, without sacrificing overall operating performance. CAMOPLAST 1.5 COBRA WIDE TRACK: The primary purpose of the 20 x 154 x 1.5 in. 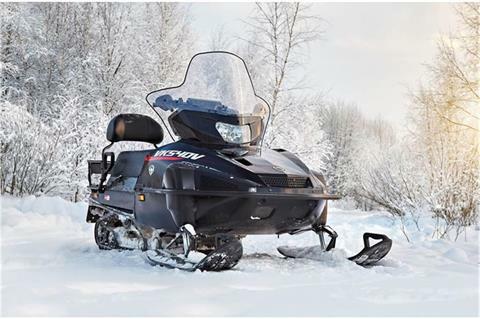 Cobra track is to fully maximize all available snow with confidence-inspiring deep snow floatation and powerful pulling force. The 1.5 in. 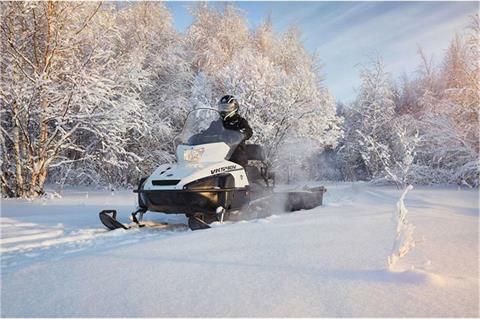 lug is perfect for low-speed or high-load situations that utility sleds often function in. 540CC 2-STROKE FAN COOLED ENGINE: A proven 540cc 2-stroke twin engine powers this ultra dependable utility snowmobile. 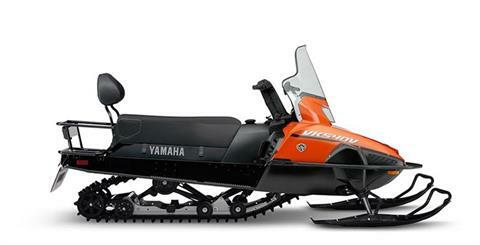 Based on the legendary 540cc engine, Yamaha engineers improved midrange torque and reduced fuel consumption by nearly 25% with this newest version. 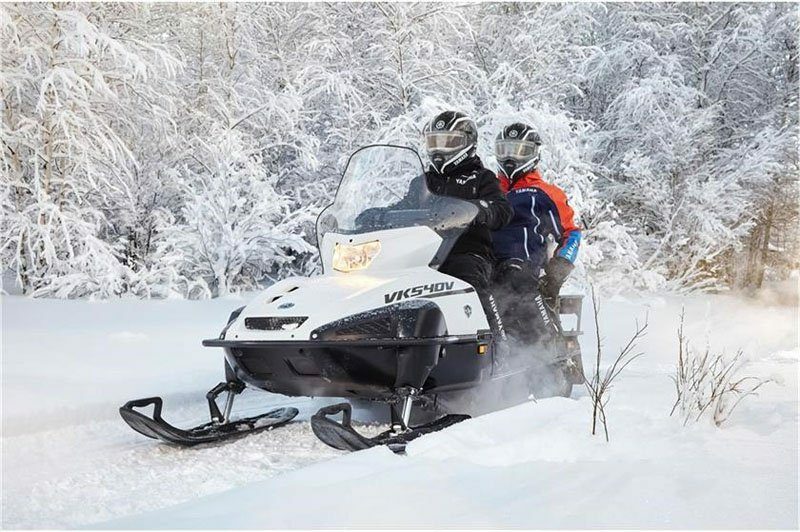 The improved efficiency meets current emissions standards with even more reliability than its predecessor. HEATED MIKUNI TM33 CARBURETOR: The heated Mikuni TM33 flat slide carburetor delivers crisp throttle response. Small dual electronic heater coils embedded in the carburetor body stabilizes idle speed and reduces plug fouling. Combined, these efficient carburetors help deliver great fuel economy and reliability. DUAL-BULB HEADLIGHT: The VK540 features a dual-bulb headlight. The twin headlights throws more light on the trail than the previous single bulb design, and is fully integrated in the overall styling cues. HI-OUTPUT STATOR RING DESIGN: The VK540 has a large, multi-coil stator ring design to develop over twice the electrical output of the original model. 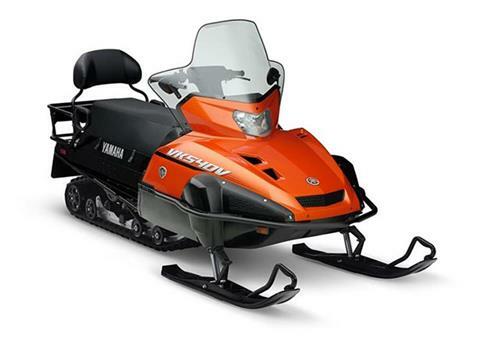 The 400 watt output is used to power the carb heaters, twin-bulb headlight, the hand warmers and other accessories. LARGE CAPACITY FUEL TANK: Enjoy extended range and expanded work capability with a large fuel tank. The tank boasts a capacity of 11.6-gallons. Combine that with the clean-running engine and you'll see nearly double the range on a single tank of fuel, as compared to the original VK540.